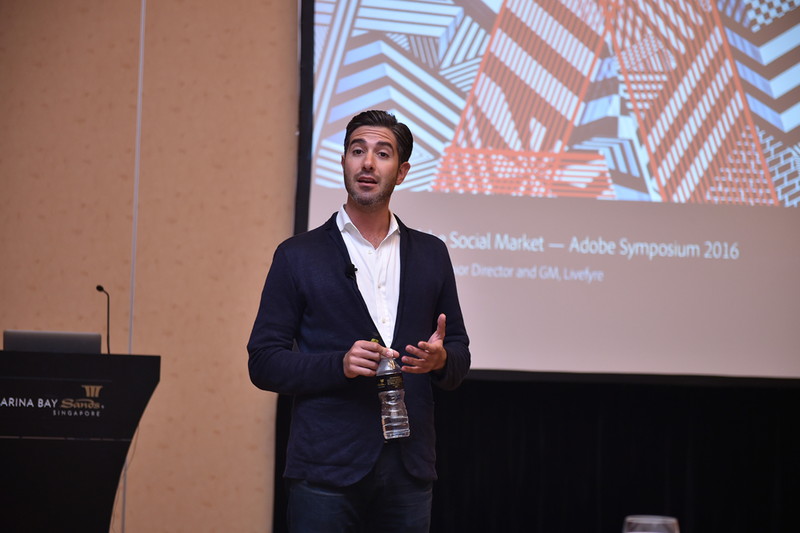 The 3rd annual Adobe Symposium this year focused almost entirely on what Adobe calls the ‘Experience-Led business.’ The by now proven symposium concept, held at the efficient Marina Bay Sands Expo Centre, brings together over a thousand marketers, data scientists and even IT-people. You get a full day of entertainment and showcases with the latest and greatest in marketing, customer experience and creative solutions from the Adobe suite, or should we now say product cloud. The morning session consisted of an intense series of showcases interspersed with a client presentation here and there. The highlight was the presentation by Rebecca Eclipse, Head of Strategy Management at Globe, the leading telecom provider in the Philippines. She explained how Globe embarked in 2009 on a journey that would lead them from a product focused company to a customer experience company. In an endearing and entertaining style, she talked about the hurdles and pain the company went through on this journey. Today, she said, Globe has seen tremendous and sustainable growth through a relentless focus on customer needs and the customer experience. They grew this way from the third in place challenger to the market leader in seven years. Interesting enough, once they had become the market leader, they didn’t succumb to complacency (in Singapore known as ‘the C-word’). They started wondering what would continue them to stay motivated and enjoy their jobs. After a period of reflection, Rebecca claimed they realised that they wanted to make the Philippines a great place to do business. Many people think of the Philippines as a place where it is tough to do business. Globe wants to make the Philippines a place where families’ dreams come true, where businesses flourish in a nation that is admired. This might sound fluffy but with a market cap of 46% and one of the best employee retention rates globally, there is definitely enough reason to believe that their strategy could deliver something of the kind. The second interesting presentation came from Gemma O’Brien, a typographer. She talked about authenticity and how important that is for brands to capture attention of an audience. Humans simply crave for real experiences and brands should more than ever deliver this. She is an interesting artist to follow on Instagram. 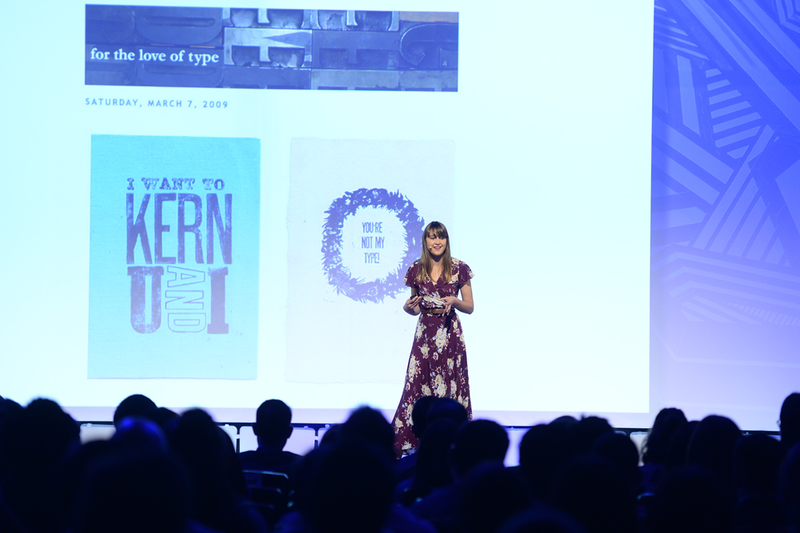 Gemma’s presentation was also a good example of why Adobe still holds an advantage over other tech vendors’ events: seemingly unlimited access to creative talent and interesting artists, and a willingness to trot them out on the podium. Most of the morning sessions featured showcases of new Adobe Marketing Cloud, Experience Cloud and Creative Cloud features. The sheer flood of information was a bit hard to grasp at times but if anything, you quickly understand that Adobe is by now a real powerhouse when it comes to pretty much any form of marketing and advertising technology. 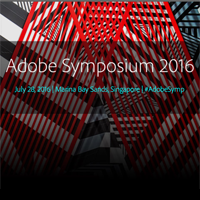 Adobe used the Symposium to show that they are definitely at the forefront of content and asset management. The focus is on content velocity, which can be understood as the ability to create, publish and manage content faster and in a personalised way. A good example of content velocity was presented by Jordan Kretchmer, Founder and CEO of Livefyre. Livefyre is a social media content management platform that got acquired by Adobe in May this year. Livefyre will be integrated in the Adobe Experience Manager. Jordan also presented a view on social media management solutions in a separate session. He explained why he thinks that there are currently too many solutions that overlap in many ways. We will focus on this in a separate article. Really impressive is Adobe’s venture into IoT for retail, which they call Adobe Connected Shopping Experience. Vineeta Bathija presented a shopping bag that connects to a mobile app. By pairing the app and the bag’s sensor, the bag scans the products you put into it and adds it to your app’s shopping basket. This allows an Uber-like payment scenario. When you leave the shop with the bag, a payment is automatically executed in the mobile app. We will write a separate article about this as Adobe also has a strong opinion on how IoT will shape the future of retail shopping experiences. The only thing we wondered about is whether you would once bring back the smart bag (think wire plastic products littering the landscape around supermarkets), or whether the built in tech is cheap enough to make it a disposable item for the retailer. Vineeta himself however, was careful enough to note that this was only a proof of concept and the actual product is still a while away. 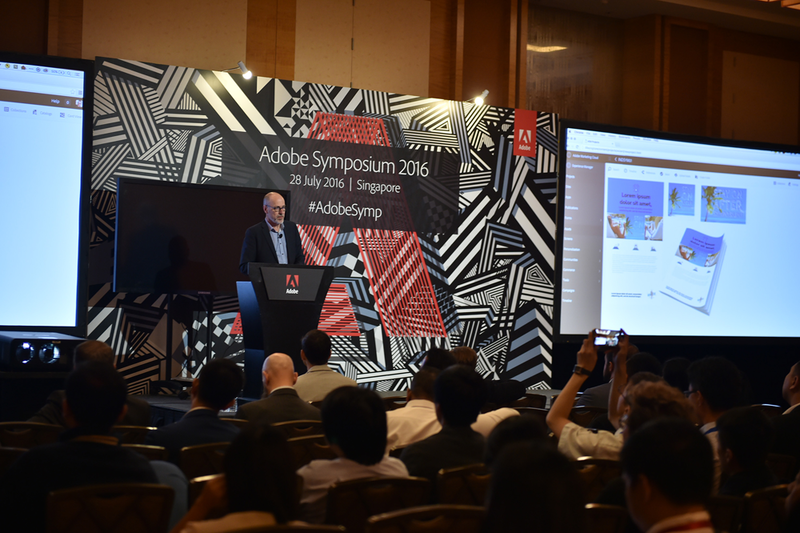 Another sign of true creative computing power was presented by Adobe long-term director of digital media, Michael Stoddart. He showcased the capabilities available in Creative Cloud today that allow you to take a 360 movie, shot with a 500 USD Ricoh camera and place dynamic, personalised ads in the movie. Once finished you can publish this 360 movie straight to Facebook. Today you can place static ads but in the near future moving images and even 3D models can be placed through the Creative Cloud. The afternoon consisted of 4 breakout tracks; data-driven marketing, customer experience, cross-channel marketing and programmatic advertising. These sessions featured a mix of client, agency and Adobe presentations, including a few Adobe partners like VML. Marketing Directors from ANZ, Kellogg, StarHub and Great Eastern Life shed some light on how they focus more and more on customer experience and change their marketing approach to a data-driven approach. Invariably there are remarks about the complexity of driving change and getting the right talent on board. This is something everybody in the industry is dealing with. The funniest and most interesting part of the Symposium was a programme item called Sneaks. This session, co-hosted by the incredibly funny and at times overwhelmingly present Singaporean artiste Michelle Chong, presented five innovations that Adobe might be featuring in their product portfolio in the future. The first one was a demonstration on how to build a mobile app in 5 minutes, not 5 weeks. The presenters built an app for Audi in Adobe Experience Designer and published it on the spot, on an iPhone. Once done they showed how you can keep updating and improving the app and see the final result immediately on the iPhone again. The second demo was rather boring compared to all the create fireworks on display, but was probably the most in demand for marketers. Adobe showed how they are able to track cross-channel attribution to sales and transactions. In other words, with this technology you will be able to understand which channel contributes the best to your sales results. The third Sneak elevated personalised marketing to personality marketing. This solution enriches a customer profile with a personality analysis of your tweets on twitter. Michelle was taken as an example and came out as, among other things, extrovert and neurotic. The web page of the Fossil website that was enabled for this demo with this personality enhancement, showed all sorts of red items after a refresh. Alas, it turned out that this was not Michelle’s favourite colour (and neither did she seem very pleased with being labelled neurotic) but the basic idea behind adding personality to personalisation is quite an intriguing proposition. It revives the idea of psychometric segmentation, which we have seen being mooted (and subsequently fail) many times over the past few decades. This was followed by a demo of a screen with a Kinect controller. The controller can scan a person’s body measure and based on this presents items of a store’s (or e-commerce business) collection that would fit you. The style of the items presented can fit your lifestyle is this data is available through e.g. a membership programme. Finally, we saw a demo of personalised video ads. The idea here is that e.g. a sports brand can have automatically personalised videos. If I am a bicycle fan, I would see people on bicycles whereas a hiker would see people hiking up a mountain, etc. Sneaks shows how Adobe tries to stay ahead of the curve through R&D, prototyping and in this case crowdsourcing feedback from the audience. 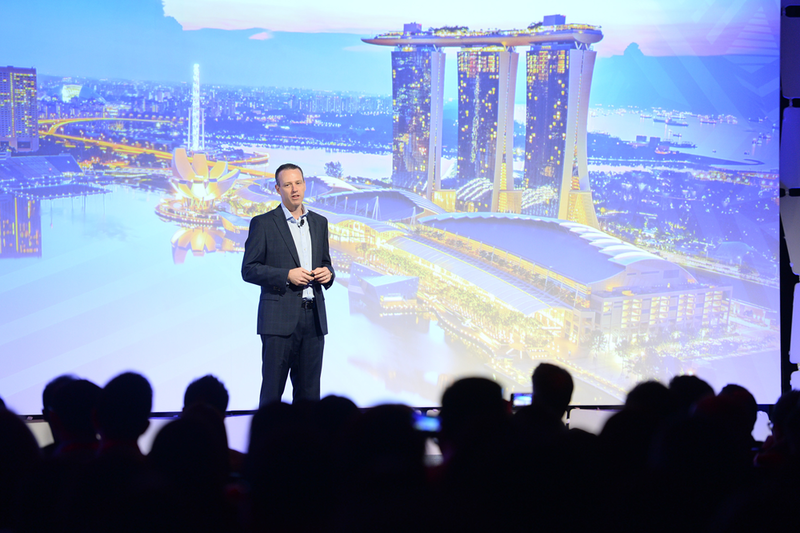 The event ended with closing remarks by Paul Robson, Adobe’s APAC President, followed by networking drinks at Avalon in front of MBS. Most people we spoke there agree that Adobe had pulled off another great event. It certainly was an experience. There was maybe a tad too much focus on selling Adobe’s own products but then again, this was their party. Adobe have by now a truly rich and mostly integrated set of tools and platforms for creativity, marketing and customer experience management so there is a lot to show and tell. There were certainly a few truly memorable presentations, like the one by Globe and the demo of the Connect Shopping Experience. In two articles that will follow, we will focus on Adobe’s business strategy for the future, the Social Media tools framework, as well as the IoT part for retail in more depth.